Interpretive exhibit examining the historical and cultural context of the the Industrial Workers of the World Photograph Collection at the Labor Archives of Washington, University of Washington Libraries Special Collections. The Labor Archives of Washington (LAW) houses several manuscript and photograph collections relating to the Industrial Workers of the World. The bulk of the collection was donated by the IWW Seattle-Joint Branches when they moved from their hall in 1965. The University of Washington Special Collections was contacted to collect anything they thought was important and brought back an array of photographs, pamphlets, and manuscript materials that are available for researchers. Wood and Metal Sign from the IWW Seattle Joint Branches Hall in Seattle. Archival finding aid to the Industrial Workers of the World Photograph Collection. This exhibit was designed and researched by University of Washington Department of History student Senteara M. Orwig during two successive internships with the Labor Archives of Washington. Orwig scanned all the photos in the exhibit and did extensive preliminary research on the historical context of the photographs, assembling them into a preliminarly processed collection. The LibGuide text was edited for content, style, and facts by Labor Archivist Conor Casey. We aim to improve our description of people and events in this exhibit by providing the most accurate information possible. Comments or corrections are welcome! Email Conor Casey at cmcasey@uw.edu. 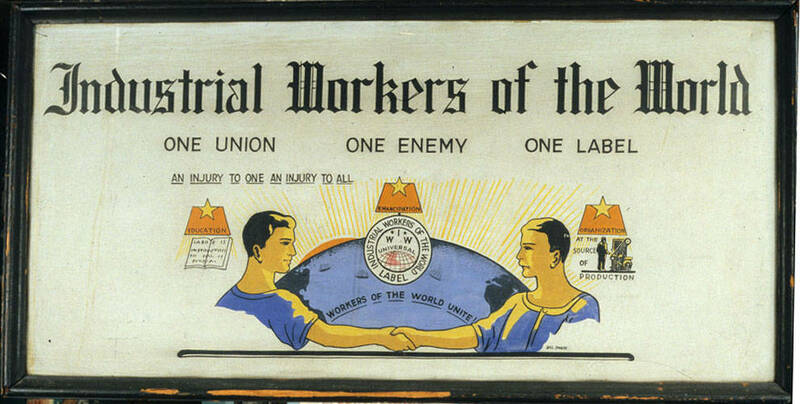 Members of the Industrial Workers (IWW) were known as the “wobblies.” However, the origins of the nickname are contested. The most famous story is that the name came from a Chinese railroad construction cook who proudly claimed he was an IWW, but because of a thick accent the acronym came across as “I wobble, wobble.” According to the labor folklore, the name wobbly stuck and the IWW adopted the nickname with pride. Labor folklorist Archie Green contests this story, proposing several alternate explanations in his book Wobblies, Pile Butts, and Other Heroes: Laborlore Explorations. Urbana: University of Illinois Press, 1993. 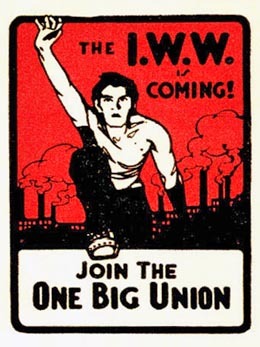 The IWW aimed to create "One Big Union" of all workers. Click the image above to see a diagram illustrating this vision.